Habit: (Annual) perennial herb; caudex short, < 1 cm diam, vertical, +- brown; rhizomes, stolons short, forming offset rosettes or not; taproot slender. Stem: 5--60 cm, spreading to erect. Leaf: basal 3--30 cm, blade 1--8 cm, oblanceolate to deltate, base truncate to long-tapered, tip obtuse to long-tapered, often some petioles with bulb-like base; cauline 1--8 cm, free, lanceolate to ovate, sessile, generally acute. Inflorescence: branched or not, stalked, open, bracted throughout; flowers generally 10--20. Flower: sepals 3--6 mm; petals 6--12 mm, generally +- pink; anthers maturing before stigmas. Fruit: 2.5--3.5 mm. Seed: 1.5--2 mm, round to elliptic, shiny or dull. Chromosomes: 2n=12,24,36. 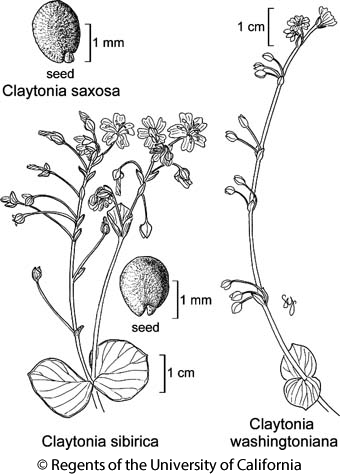 Citation for this treatment: John M. Miller & Kenton L. Chambers 2012, Claytonia sibirica, in Jepson Flora Project (eds.) Jepson eFlora, http://ucjeps.berkeley.edu/eflora/eflora_display.php?tid=19638, accessed on April 23, 2019. NW, CaRH, SnFrB; Markers link to CCH specimen records. Yellow markers indicate records that may provide evidence for eFlora range revision or may have georeferencing or identification issues. Purple markers indicate specimens collected from a garden, greenhouse, or other non-wild location.